Everyone knows that women have two X chromosomes, while men have just one. Instead of a second X, men have a Y chromosome. The X chromosome is far larger than Y, with 1098 genes versus just 27 genes that are unique to the Y chromosome. Well, one might argue, men have all the X chromosome genes too, so what's the advantage to having an extra copy? It seems that we only need one copy of each of these 1098 X genes. As it turns out, female mammals (not just humans) have a unique advantage over males: they get to choose, for each copy of those 1098 genes, which ones to use. And they can pick and choose different ones along the X chromosome, sometimes using the gene (called an allele) from their own mother, other times using the allele from their father. The other copy is turned off, through a remarkable process called X inactivation. The female advantage is more than just the choice of which X chromosome to use. An amazing feature of genetics is that females can use different genes in different cells. 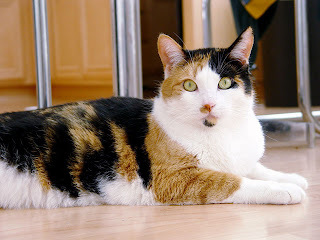 The calico cat shown here is a beautiful illustration of this: early in development, some of the pigment cells in this cat chose the orange fur gene, while other cells chose the black fur gene. As these cells divided, they created patches of black and orange fur. As far as anyone can tell, these choices are random, which is why every calico cat has a different pattern of black and orange fur. It's also why every calico cat is female. Oh, and there's one more advantage women have over men: only women can be moms. Happy Mother's Day! 1 ...they get to choose, ... which ones to use. You present a most excellent example of the latter, any evidence of the former? And a happy Mom's day back at you. Well, obviously this isn't a conscious choice, but I was being a bit facetious here. More precise would be to say that during development, the cells of the mammalian female can inactivate different alleles of each X chromosome gene, giving them greater genetic flexibility and possibly providing an evolutionary advantage - which in turn may explain why X inactivation evolved in the first place. But that's a bit dry, no? Just a technicality: not all calico cats are female. The rare XXY male can be calico as well.